Here is block #2 for Mommy's Ties. I know that in my last post I said I was going to do 2 of these and make a needlecase/book, but I am having so much fun doing these! I am considering doing 6 of them and making a small quilt instead. I don't know what do you think? Only a couple of weeks until I go to Maine! 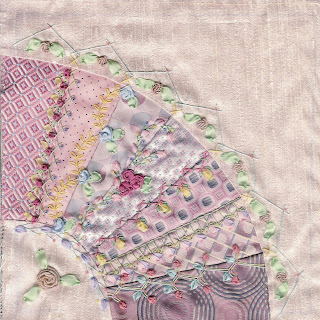 I think I have this class down....Now on to study up for Crazy Quilt 101 and Crazy Quilt 201. Very pretty Val! Love the pastel colors. Are these all ties? The block is gorgeous. Did you use neckties or fabric? Very beautiful stitching. I think you should keep going also and not stop at just two.